Okay for the first time today since having new teachers, yoga school was excellent! Oddly enough I believe it's because we are getting back to our roots. 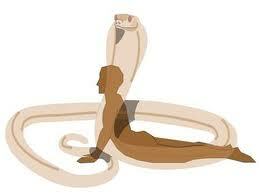 We had morning practice and, we had the most amazing workshop on one asana: Bhujangasana (Cobra). Insert JI Joe reference! Today our poses seemed to be so....dynamic, nothing was static. One teacher even taught tadasana in a way that made us all sweat! F'ing amazing! If I may use such language to describe today's yoga teaching and practice. Back to cobra. A few weeks ago we had most of our asanas taught by gifted a teacher named Dawn Priebe. I remember that when she had us in cobra, she said that one of her students described it as "like making love to the floor!" It sounds a little strange for a yoga posture, but every adult in the room got what she meant by it. Press the pelvis firmly into the mat. In Bhujangasana your pelvis should be cemented to the floor. The hands are just beside the shoulders, the arms and elbows are tightly knitted to your side body and of course the shoulders are down away from the ears and the scapula are reaching down the back and close together. The tops of the feet are pressed into the mat and you are recking your pedicure. The thighs are engaged, so your knees and shins are lifted off the mat, with the tops of the feet and thighs remaining firmly pressed into the mat. The pelvis continues to be pressed firmly into the mat and you squeeze the gluteal muscles together like you're trying to hold a walnut between them. Your abs are engaged as you inhale and lift the torso off the mat. Look forward. Shoulders remain down and away from the ears. Breathe. The lower back is working here, but not to a point of pain. The muscles here are actively engaged but not straining. If it feels uncomfortable on the low back, make sure that all of the muscles described earlier here are engaged. You should be able to lift the hands off the mat for 15-30 seconds with the torso still off the mat. Keep the breath strong and steady, deep and even. The shoulders are not in play here. Though you may use the hands firmly planted into the floor to propel you upward, that is all they do or you may extend the arms out behind you. This way the pose is dynamic. The muscles of the lower extremities are fully engaged and your are bringing much needed strength into the lower back. As you lift up and look forward open the chest. Allow the heart to melt forward. Breathe. Feel the extension in the spine as the cobra lifts to strike. 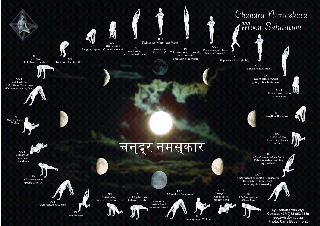 Lets hail the beautiful full moon with a few moon salutations! Anyone know any other moon salutation sequences? The moon represents the ebb and flow of the tide. The highs and lows of emotions and physical activity! She stirs us to mate with our beloved. And for women she often indicates our own flow. The moon can be a guide to planting and harvesting in nature and on our personal life journey. It would be an honor to salute the moon from which we receive so much and think of and honor not nearly enough. This is a sequence I found, but I am also interested in creating another sequence that really honors the silvery sky goddess that speaks to us all in her fullness! In the weeks to come I will post a sequence of postures that will include ardha chandrasana and other postures that open the heart and feel expansive, just like a full moon rising. Today I had an extremely emotional day, so by the time I got home I knew that I had to take it all in and just be with it. The first thing I said to myself was "take it to the mat Ellyn!" Before I got on the mat I decided to go to my car to get my ipod. I wanted to have some music going, to ensure that I would get outside of my head and just be in my body and practice. I have this thing for walking around barefoot. I jokingly call myself a shoe whore because I love cute shoes, but I truly love to be barefoot as much as possible. As soon as I step foot outside of my apartment door, I planted it on a small sharp shard of glass. Thank God yoga has rendered me flexible enough to bring my foot up high enough to remove the glass. After the bleeding stopped and the pain subsided, I got on my mat. I had my play list going and started sun salutations. Before I could get to the salutations I started sobbing uncontrollably. I tried to push through it and do my sun salutations, but at the top of every push-up the sobbing took over my breathing. My mind started to race. Why couldn't I be still? Why couldn't I just get through this? Why couldn't I just practice and flow and let go? I searched my mind for a book with postures for depression or a gentle practice like I had during another really emotional period but nothing came to me. I released myself from plank and found myself in sobbing child's pose. "How is crying, doing yoga?" I said to myself! "This isn't yoga...." Or so I thought! So many things can come up during yoga. We normally think of the physical things like tight muscles or mental things like the thoughts that won't go away. But crying on the mat? What's up with that? It's really not much different from wandering thoughts that come relentlessly. Except of course the loud belly shaking sobs. But today for me, this became my yoga. I stayed on the mat. I continued to cry and then, I stood up. That's when a lightbulb came on. I was in tadasana (mountain). It was just yesterday in my yoga workshop that we practiced a meditation in mountain pose. I stood tall, noticed my breath. I noticed the tension in my body, I allowed it to relax. I felt my tailbone drop like there was a weight hanging off of it. The curve in my lower back became more natural and less exaggerated. I relaxed my shoulders away from my ears and I continued to breathe. I inhaled my abdomen and kept a slight bend in my knees. I lifted my toes and planted my feet firmly into the mat, pressing through all four corners of each foot. I felt firmly grounded, completely rooted and solid in my posture. I was a mountain. Sometimes animals make their homes in mountains (animals of fear, hurt, anger, pain, desire, vice), mountains have to adjust to all climates (emotions), people walk on and climb mountains (sometimes people don't behave in the ways we would like and sometimes they walk all over us, but still the mountain stands firm). Sometimes the mountain is snow covered (we may not be able to see what's in front of us with clarity but know that it is just beyond our sight and in time it will be revealed). Sometimes rivers run through mountains (just like my tears, and mountains just allow the rivers to flow and so must I). Tonight this was my yoga. 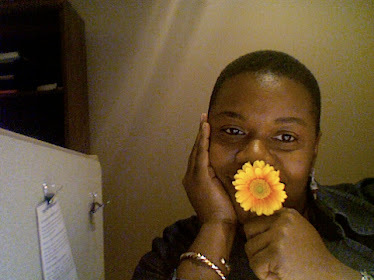 This was my mountain pose, this was my saving grace. Up until very recently savasana was a posture that I allowed my body and mind to completely let go relax and fall asleep in. I recently read an article about savasana and it got me thinking about how to practice savasana it in a very different light. Wait, did I say practice savasana? Yes I did. I know, I know, it's corpse pose. It's the one where you are supposed to be totally relaxed, free and let your body rest and fall asleep, or so I thought. Yes no tension no thought and maybe even catch a few zzzzz's. That was my practice of savasana. No more! It actually changed this past Sunday. Even though I had read an article on savasana (by Michael Stone) weeks ago I had not yet begun to put it into action. I think I was wrestling with the idea of it in my mind. I liked being able to let go and rest and even sleep after a good, hard, long, deep, sweaty practice, or even after a restorative gentle practice. But on Sunday I decided that I was going to relax completely, but also be aware. I thought to myself that there's no reason that I can't at least try it. And to my surprise I found a hidden jewel. Remaining awake and aware in savanasa is what I like to call conscious passivity. While the body is passive and completely relaxed the mind is aware. You know where your body is in time and space and you watch the breath rise and fall of its own accord. Thoughts may come but you let them roll away like clouds. With time the thoughts are no more. You are present, on your mat vibrating with radiant energy there is a sensation a tingling radiant feeling that engulfs the entire body. This is something that you must truly experience to understand. If you've never done it, I implore you to remain awake, aware, and fully conscious during savasana. Please come back and share what your experience of conscious savasana was.